I woke up this Friday morning with a completely strained neck, unable to move or tighten the muscles or else pain. But thermal patch (that resembled a Maxipad for the neck) and ibuprofen and it was as good as moderately strained. Today, I gave my 30-day notice to my NW Portland apartment with plans to move to Corvallis for a couple of months where I plan on checking out at the Black Diamond Poker Club. But tonight, I had to ignore my neck and the move and focus on Final Table’s $5000 guarantee. 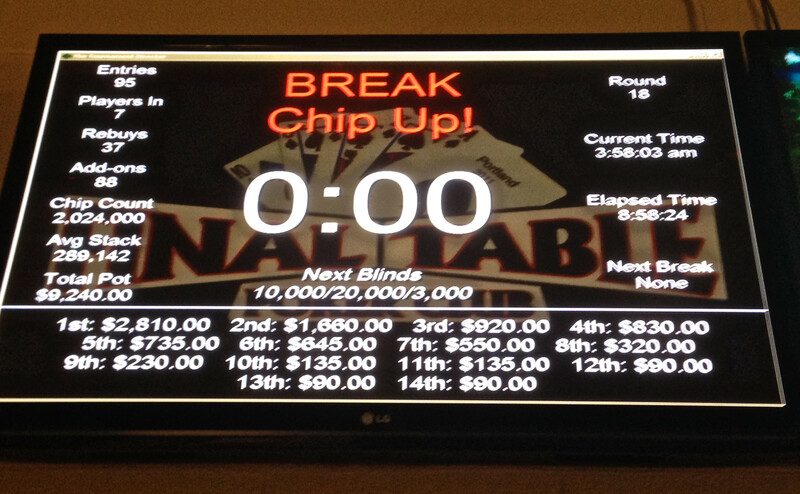 Out of 95 people, I made it to the final 7 where we negotiated a seven way chop for $1064 each. The game ran from 7pm until the dark dredges of 4am. Coincidentally on the bus ride to the club, I met another poker player headed to the Aces Players Club, and we just talked poker. He had seen me reading my poker book. Having Full Tilt recently refund my poker balance also made for a good starter. Friday night is one of the biggest, and most profitable, times to play Portland. The Portland poker scene is active, and it just comes alive after a long week of work for many. I had played at Encore’s Friday night big game but didn’t make it too far so I was counting on Final Table’s weaker field. With 95 entrants including all the rebuys and addons, the prize pool went up over $9000. For the first few hours, I played mostly flawless ABC poker. I value bet successfully when I was ahead (such as triple barrelling JJ on a low board). I also found myself taking less spewy stabs in multiway pots now. Midway into the tournament, my stack size was dwindling relative to the blinds so I started to make shove moves to replenish the stack. I was looking to make a move for several rounds but found few good spots. Because it took me a while to find my spot, I actually got someone to fold AQ with my CO shove with A5! That had actually happened several times, and it’s amazing how much respect I can get sometimes on the table when my shove range is so ridiculously wide. When it came to the bubble, the game really slowed down. Though I played aggressively enough on the bubble to build up a good stack. There was a 26-year old Viet guy who owned an auto body shop that gave me some troubles when he flatted my raises making me play postflop out of position. But I elected to play weak-tight postflop which minimized my losses. I went to the final table at around 3am with an average stack. I made a couple of moves here and there but I tightened up to watch the shortstacks bust. After 3 people knocked out, at 4am, and with the huge blinds (chip leader had 12 big blinds), we agreed on an even seven-way chop so we could all go home and sleep. First place would have paid $2810, second at $1660. Pretty good deal for me, I was the shortstack at the table! Though I could have done damage to anyone. Leading to my biggest cash so far of $1064 with $80 invested. 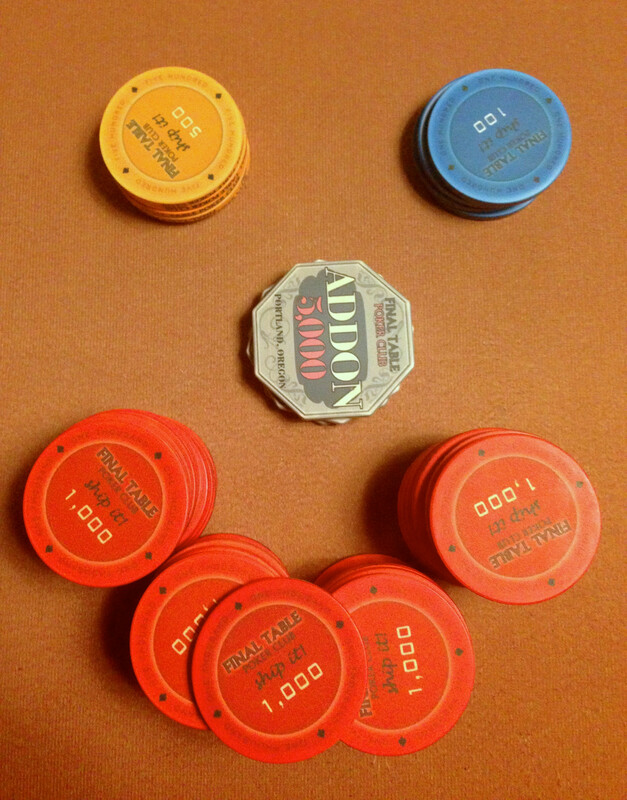 Learned to tip the dealers 7% when cashing big. Everyone walked away with smiles. I went home with my mom still awake at 4am, and then I could finally eat dinner.